I've spent some time over the last few weeks talking about the new paper Stephen Davis and I have up on probate in the Old South. Now I think it's time to talk about new directions for scholarship. While we hope that our study is generalizable to counties outside the uber-wealthy places like Greene County, Alabama, I think that's a subject on which we need some additional work. How much do more established counties -- in places like tidewater Virginia and piedmont North Carolina -- show similar levels of innovation in legal instuments, like trusts? How consistent are the patterns of use of trusts to keep property within families and especially away from the people children marry? How common is the conversion of real property into trust? Do those patterns increase over time? We also need to link these studies of what's going on at the ground level with what's happening in the appellate courts: how do courts react to expansion in trust purposes? And in particular how do judges interpret the investment and management decisions that trustees make -- and how do those decisions reflect the constraints that appellate courts impose. (What, for instance, do we make of the prudent investor rule -- and is that something we look at differently in the boom and bust states like Alabama and Mississippi?) One thing that we did little with were will contests (not just challenges for competency and capacity, but also contests over the management of an estate). One other way to slice these questions is to look not at individual families, but across a broad spectrum through lawyers' papers. How do things look from lawyers' papers, like Henry Watson, a Greene County lawyer whose papers are at Duke? How important are trusts to the practice of the lawyers in the old South? How much specialization is there? Where do they learn about these? How are ideas transmitted across space? 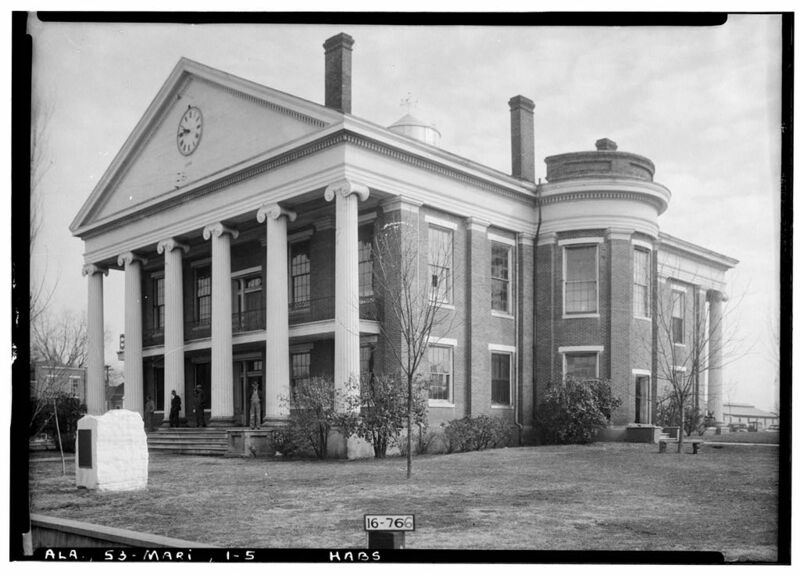 The image is of the courthouse in Marion, the county seat Perry County. You may recall Mary Dudziak has a haunting story about a trial in the Marion Courthouse in "Death for a Dollar Ninety-Five."